SHREVEPORT, LA (KSLA) - According to a new report by the city of Shreveport's Internal Auditor, the Water and Sewage Department is running a high risk of possible fraud, waste, and abuse, when it comes to the department's water meter reading and billing. 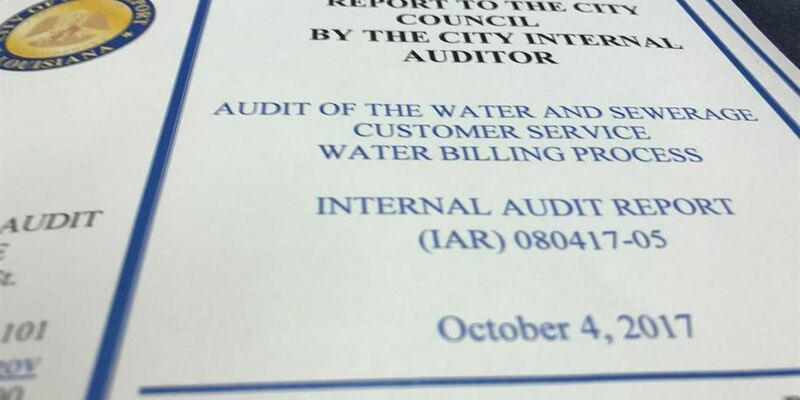 The audit dated October 4, 2017, and first obtained by KSLA, indicates that the water department staff is often slow in responding to meter repair issues, possibly costing the city and water department customers untold sums of money. Additionally, an automatic meter reading (AMR) system costing the city $7.4 million, designed to improve efficiency and revenue collection, is not being used according to the report. "There is an 'Unread Meters Report' for the meters equipped with AMR. However, no AMR readings are being used." The audit suggests that the city determine how much it would cost to repair or replace the AMR system initially installed in 2009 through 2010. The audit also states that billing software the city purchased for $3 million is incapable of detecting and stopping the overbilling of customers who automatically pay through checking/savings accounts. After billing has occurred, if staff becomes aware of those abnormal bills, they try to notify the customer by various methods (calling, emailing). However, for those customers that have automatic payment, the abnormally high bill will hit their checking/savings account." The internal audit also supports a KSLA investigation, that the city water department is largely unable to process reports on broken or malfunctioning meters that are recording abnormally high water usage. Our reporting details instances of customers complaining of skyrocketing bills at homes with suspected malfunctioning meters. In those cases, the city claimed monthly charges in the hundreds of dollars, was due to leaks inside the home. However, the residents or their landlord hired plumbers, who found and fixed minor issues, only to have the next month's water bill increase more than $100. The audit does not indicate the number of meters registering abnormally high or low water usage. But 70% of the accounts registering abnormal readings are chronic, meaning the inaccurate water usage totals span multiple billing cycles. During our review of the abnormal readings report (aka, "High Low Report"), we noticed several instances of accounts that had abnormal usage for several consecutive billing cycles through three months (May thru July 2017.) Within these three months, the same meters appeared on the abnormal report 70% of the time with chronic problems such as occupied with zero usage and 'vacant' accounts with usage accounting for 23% of the abnormal readings." Currently, there are 81,000 meters in Shreveport that produce bills for 66,000 customers. The report states that each of those meters is manually read every month, despite the Water Department admitting the "meter shop area" is severely understaffed. In its published response to the audit, the Water Department writes under the circumstances "we are doing the best we can to keep up."